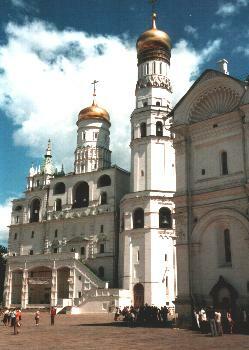 MOSCOW, JUNE 2002 - Some places you have seen hundreds of times on television, have seen so many pictures of them in books, and you know all about the details of the buildings and history. But still, one day, if you really visit these places, it does something to you. Some feeling that it is not like you thought it would be, or just the effect of realizing you are actually standing in a very famous place. And afterward, back at home, when you see these places many times again on television, it is never the same as before. Because now you think 'I have walked on that particular pavement, I have crossed this road, I have seen the inside of that church, etc...'. 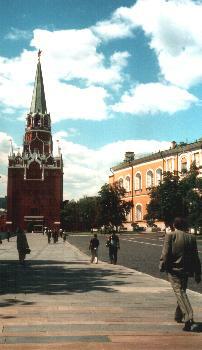 The Red Square is one of these places. One of the following days I visited Lenin's mausoleum. There is actually not much too see inside, and it all looks quite 'unreal' to me, but still every day there is a line of visitors. It just one of the things to do when in Moscow... Regulations are very strict. You cannot take your camera or any drinks or food inside, you have to take off your hat before entering, and you have to respect absolute silence ! I was not very serious about this last rule... As soon as you walk inside the mausoleum, you have to descend some stairs, which are almost unlit. As your eyes do not have the time to adapt to the darkness, you just have to shuffle to find the stairs, and I even didn't see the Russian security men standing on the sides, but I knew quickly enough they were there, because when I said to my friends "It is dark in here, I cannot see..." , they reminded me promptly about the "complete silence" rule ! An interesting part of this visit is also the graves of the other communist party members and former sovjet leaders, which are buried in the space between the mausoleum and the Kremlin walls. 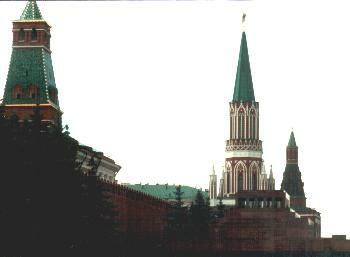 Many Russian cities have a Kremlin, but the one in Moscow is always referred to as "The Kremlin". In present times, inside the Kremlin walls, you find a mixture of past and present. 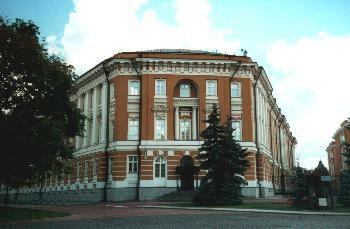 The tsarist legacy such as the Armoury, the different cathedrals, Ivan's clocktower, the big cannon,... but also the current government buildings and the residence of president Putin. One rule that our guide made clear quickly, is that it is forbidden to walk anywhere but on the pavement ! If you get off the pavement, security officers use their whistles... and they have to use them a lot since not all tourists know or respect this rule. Also when you stand too long in one place, especially when looking in their direction, they also tell you to move on. Only privileged vehicles and officials have the right to use the roads. Here you can see the black Russian limousines you recognise from every movie...but no photos allowed. Also no photos allowed inside the cathedrals or in the armoury (or only after paying a photo allowance fee). The armoury is a museum now and contains actually not a lot of armour, but 'everything tsarist' can be found here, ranging from tsarina dresses and jewelry to horse carriages, Faberge Eggs and (very expensive) tea cups. The cathedrals are also all museums and have a very interesting collection of icons and also some graves can be seen in here.